Linda Wiles: ‎ to What's Going On Muskogee OK!! Was Lindenloft Pizza in a small strip mall on York back in the 70's? If so, what was the name of the mall and was it on the corner of York and Chandler where Homeland is now? Tracy Gatwood: Dad sold it 6-1-14 to the individuals that own it now. Christina Lewis: I remember my dad telling me how he used to skip school with his friends and go to "the mall and get lindenloft's" and many other stories of Muskogee from back in the day, late 70s early 80s. It's created this burning passion for history, especially local history. I wish I could travel back and see for myself how it used to be. After a jr. high football game it would be standing room only with 300 people cramed in there. Pam Welch Ross: I'll never forget the train and those alpine sticks. Renee' Moore: It was where Homeland on chandler is now. Open in Shadow Wood. We make the same alpine cheese bread, we bought the business from Johnny Linden 3 years ago. Our name is Three Rivers Pizzeria. Beverly Redfearn Hiser My cousin and I used to go and play the sit down Ms. Pac Man game he had where you played against each other. It was great. Derrick Abel: It's still around too. I have a new one now. Kenneth Alexander: I think it was still owned by Johnny Linden and his then wife when it was J & S.
Charlene Menees Points There was a clothing store in the mall too call Donna's I brought the dress that I got married in back in the early 70's. Johnny Linden: www.lindenloft.com www.4000songs.com there are over 7000 gorgeous classic songs that you never hear on the radio, that will put you in a fabulous mood and change your life. 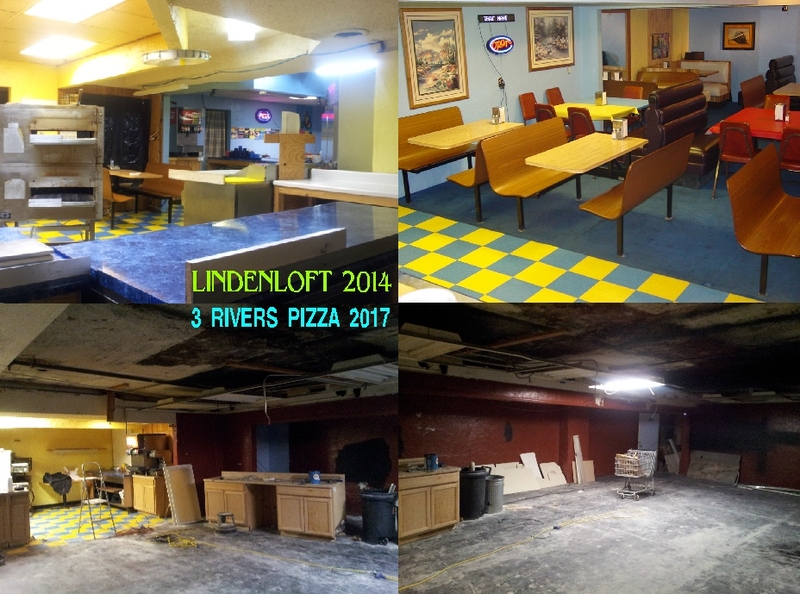 Johnny Linden: You can see pictures of the 1980's Lindenloft with the train and the pretty blue & yellow Lindenloft decor in Shadowwood Mall from 2007 to 2014. Johnny Linden: On page one at the top is a link to watch all this years NBA basketball games 24/7 online for free with no commercials. Derrick Abel: There is a tab at top right of page for lindenloft's history. Donnell Thomas: Bowling alley and it was J and S before laden lofts and yes it was a on the corner of york and. Chandler. Chris Cummings Sr. I thought it was Lindenwood Mall. Tammy Chapman Calhoun Lindenloft pizza opened back up a few years ago in the bottom of shadow wood mall. Had great bbq and alpine pizza. No train but now someone else owns it now. Derrick Abel: It was the Chandler road mall. I was the last manager there and I closed it down and did cleanup in 1988. I opened Hollywood Pizzeria in the lower level of shadowood mall. Johnny Linden gave me quite a bit of the original equipment and related items. He also developed my dough and we had the original alpine, cooked the correct way. He bought it from me in 2007. He ran it under lindenloft's for a few years and then sold it to Hunter enterprises, the building owner. Derrick Abel I have the original alpine..I wonder if anyone would wanna buy it? Larry Cragg You could share the alpine!!! I would go there just to eat the alpine. It was heaven back in those days. ---------------------------------------------------- Beverly Redfearn Hiser Didn't they have shredded lettuce for their salads? Best alpine dressing and their chef salads were awesome. Linda Wiles Was it torn down during all the roadwork on York? Linda Wiles Then Albertsons built on the site. Jon M Edwards ...and you made and served pizza to my wife and I the last night of business. We will never forget that time. Diana Kennedy I loved their garlic bread. Would love to know how. It was made. Derrick Abel I know how. Megan Shea Creamy Italian dressing and mozzarella makes a good substitute for their bread. It was good stuff. Bonnie Walker: Yes, they were in the building where Zeps was in the 90's. Johnny Linden: When Lindenloft closed on 4-1-88, someone opened a bar for a while, then Zepps opened for a few years. Johnny Linden Someone remembered the 1st bar was called Legends. Chris Liebig Lindenlofts, which eventually became Zepp’s Bar and Grill. Next to it was Ty’s Hamburgers. In the back was Strictly Fitness. Across the parking lot was PJ’s liquor. When Strictly Fitness moved, Silver Buckle Saloon went in back there. It was called Chandler Road Mall. During the later times to my recollection. Janet Goodwin-Ellis: There was also a bar called Legends. Amantha Smith: So if you make it often why do we never get any? Hmmm? Derrick Abel We can go down to my old pizza place some night and have a company meeting and enjoy some real alpine pizza and garlic bread. My treat. Johnny Linden: You can get the same exact alpine pizza on the buffet all day at Pisano's Pizza. Derrick Abel: I'd like to open up a carry out and delivery lindenloft's again. But last time I didn't have community support. Samantha Smith; I think from the sound of it there would be a lot of support now. Monica Reece: I was there... Slot actually... Awesome place to eat. Larry Cragg: I’ll pay to eat there. If I can get the garlic bread like it use to be I’ll eat there everyday. Larry Cragg: Ok Derrick Abel. Let’s do this. I have money waiting to buy your food.  Derrick Abel Need 25k to open. Kenneth Alexander I think it was still owned by Johnny Linden and his then wife when it was J & S.
Donna Genn Johnston: Your right Kenneth Alexander when he married Evalyn he changed it to Lindenloft and put in the balcony or loft. Johnny Linden The Swan Brothers from NBC'S "THE VOICE" from Muskogee OK. ate lots of Lindenloft Pizza delivered at 2 am in the 2000's. J & S PIZZA PALACE OPENED IN NEVADA, MO. ON 7-9-72 TILL IT WAS SOLD TO THE LANDLORD IN 8-78. Tahlequah J & S Pizza opened across from Walmart 8-1-75. MUSKOGEE J & S FOR JOHNNY & SANDY WAS OPEN 10-14-74, added the loft in fall of 1979 and changed to Lindenloft. Closed 3-1-88. Johnny Linden opened Lindenloft back up 11-1-2007 till 6-1-2014. FOR THE MOST FABULOUS PIZZA IN MUSKOGEE SINCE LINDENLOFT CLOSED, YOU GOTTA TRY URBAN STATION AT THE STOP LIGHT IN DOWNTOWN FT. GIBSON. THEIR CRUST IS THE BEST YOU WILL FIND ANYWHERE AND THEIR ALPINE PIZZAS AND BAR B Q PIZZAS ARE AWESOME LIKE THE ONES LINDENLOFT USED TO MAKE. THEY KEEP TOTALLY FRESH PIZZA FROM 11 - 2PM 7 DAYS A WEEK ON THEIR LUNCH BUFFET AND HAVE BUFFET ON FRIDAY EVENING. NO PIZZA IN MUSKOGEE COMES CLOSE TO URBAN STATION'S FABULOUS CRUST AND TOPPINGS.